Students will gain appreciation for the work of Eric Carle not only as a story writer, but as an illustrator. what an illustrator is and orally define it. 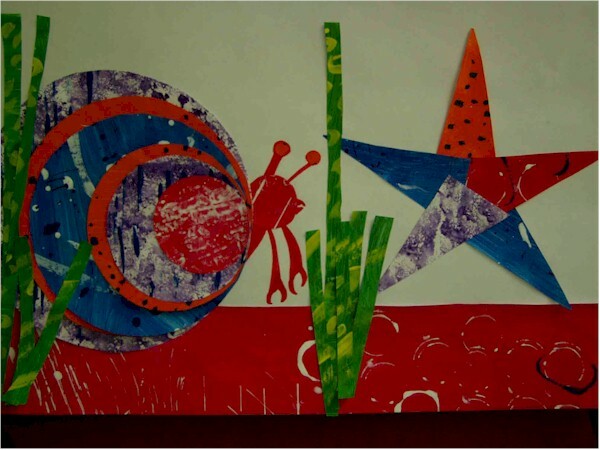 the concept of paper collage and apply it to their projects. the concept of stamp printing and apply it to their projects. the concept of texture and apply it to their projects. the concept of repetition and apply it to their projects. use different papers and alternate their colors to show depth. cut out shapes by using templates. arrange in a sequential order the shapes, from biggest to smallest, starting with the biggest. permanently fasten the shapes to the paper using glue. make an identifiable hermit crab shell, using circles. create a starfish by rotating triangles. make triangles by cutting from a rectangle. 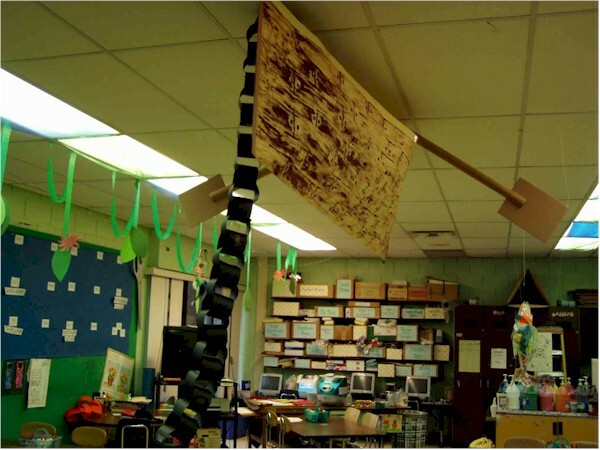 use left over scrap paper to add details to their projects. (for example: bubbles, seaweed, other aquatic life). Motivation: Upon entering the classroom, the students see that the whole classroom has been turned into an underwater world. The fluorescent lights have blue and green cellophane over them to create a turquoise tint to the room. A bottom of a boat juts out of the ceiling. There are two anchors streaming from the ceiling down to the floor. There are clear balloons fixed on the walls to look like bubbles. To finalize the look “seaweed” is clumped in certain areas on the ceiling. The students are then asked to take their seat on the rug in the activity center instead of going to their assigned tables. Read A House for Hermit Crab, by Eric Carle out loud to the class. After reading A House for Hermit Crab, ask the students if they recognize the pictures in the book. (Most of the students are familiar with The Very Hungry Caterpillar — so have that book handy as well).Have the students talk about the pictures in the book. Ask them how they think they were made? Were markers, crayons, or paints used? Talk about collage. The students will then be asked to gather around a demonstration table.Demonstrate how they will go about preparing the paper.Begin by painting one solid color on a large sheet of white paper. Then take another color and show them different painting techniques such as: using a dry brush to show texture, stamp printing using noodles and film container lids and spatter painting. As you demonstrate, discuss with them what texture is and how it is being applied it to the paper. The students are then instructed to return to their assigned tables to prepare their paper. NOTE: Before class begins, the instructor should take all the prepared paper from the class before, cut it up into smaller pieces and mix the pieces together in a bin in the center of the room. Motivation: Upon entering the classroom, the students are introduced to their new friend Hermy the Hermit Crab (the author brought in a real hermit crab). The Hermit Crab is set up on the counter and is easily viewable by all students (if you don’t have a real crab, use a poster/photo). Begin talking about the Hermit Crab, in particular about his shell — refer to the book A House for Hermit Crab. Explain to the students that they will be using the paper that they made to create homes for Hermit Crab. Explain to the class that you will demonstrate what you would like them to do for today. Call students over to the demonstration table. Demonstrate the process and steps needed in order to accomplish the completion of the Hermit Crab shell. First, choose one sheet of prepared/painted paper as well as the biggest circle template (Circle #1). Trace the template and cut it out of the prepared/painted paper. Glue the circle onto a 12″ x 18″ sheet of white paper. Glue this next circle on top of the first circle. Do the same for circle templates 3, 4, 5 and 6, making sure to choose different sheets of paper. The student orally go over the steps and then return to their seats to work on their projects. Motivation: The students enter the classroom and are asked to crowd around the aquarium. Another friend has been placed inside the habitat with Hermit Crab – a starfish (if you don’t have a real starfish — use a poster/photo). Talk about the starfish’s role in the book. Explain to students that the pictures made on Day 2 have left Hermit Crab a bit lonely and now a friend will be added to the picture — the starfish. Explain to the class that you will demonstrate first, what you would like them to do for today. They gather around the demonstration table. The paper bin is still in the center of the room. The students are asked to choose 5 different pieces of paper. Students should cut rectangles from their 5 sheets of paper. The rectangle template may be used. Then, show the students how to make a triangle by drawing a line from one corner to the opposite corner and then cutting on the line. Once finished, show the students how to arrange the triangles in a way so that they form a star.Note from Pamela: This can be difficult for kindergartners so I found that I had to show them that a starfish has 1 head, 2 arms, and 2 legs. Students then return to their seats and begin. Prompt the students if finished early to go to the scrap bin and add some more detail to their pictures (ie: long, skinny rectangles for seaweed and coral). Eric Carle is acclaimed and beloved as the creator of brilliantly illustrated and innovative picture books for very young children. Find out more by visiting the links below.